Carl Emil Hathaway, 84, of Norwalk, formerly of Darien, passed away peacefully on July 15, surrounded by his family. 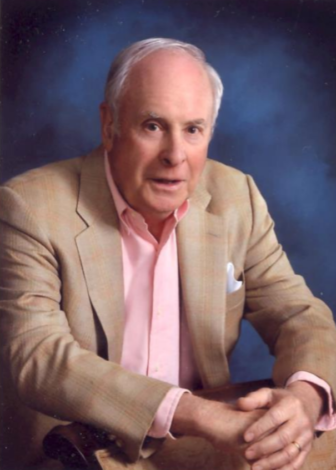 Carl Hathaway, 84, passed away July 15. His funeral will be private. Born in Boston, the son of Carl Barbour Hathaway and Tekla Neumaier Hathaway, he graduated from the Baker Elementary School, then Brookline High School in 1951, and Harvard University in 1955. As an R.O.T.C. student at Harvard, he played hockey and baseball. He served in the US Navy to Lieutenant J.G. and tried out for the 1956 Olympic hockey team before getting his M.B.A. at Cornell Business School in 1959. He began his 22 year career at 23 Wall Street with the Morgan Guaranty Trust Company, where in 1968 he became the youngest senior vice president in the firm’s history, managing over $9 billion of assets in corporate pension accounts, and was labeled the Go-go Kid of Wall Street. In 1981 he left the House of Morgan and founded Hathaway & Associates, Ltd. in Rowayton. For the next 27 years he could be seen riding his bike to work and running his two miles every day with a stop watch. Carl loved the Atlantic Ocean, Cape Cod Bay and Long Island Sound. Early in his career, summer vacations were spent lobstering and fishing in his 3 horse-power dory off of Manomet, MA. Those summer vacations transitioned to the ocean beaches of Wellfleet, golfing at Eastward Ho! in Chatham, and fishing Cape Cod Bay in his beloved red runabout, the Bloody Mary. During the ”regular season” Carl developed a passion and a love for the game of golf. Learning at Woodway, Carl moved on to Eastward Ho! in Chatham, Shorehaven in Norwalk, and Blind Brook in Purchase. At The Blind Brook Club, he served on the Board of Directors and was chairman of golf and greens. He loved his golfing community including the Tin Whistlers, and the Musketeers, and when he physically could no longer play in the matches, he stayed on all of his teams as captain. Carl’s other passions were coaching Babe Ruth Baseball and Darien Youth Hockey and later attending his sons’ and his grandchildren’s games and events. He also had to complete The New York Times crossword puzzle every Sunday and keep track of every Boston Red Sox baseball game. Carl not only played a great game of golf, he played a great game of life. Both had to be done with integrity and effort. With strength and courage, and more optimism than most people could ever muster, he battled cancer and tried to win, right to the end. He is survived by his wife Martha. He is also survived by his three sons from his marriage to Gail Oglee Hathaway: Brian Kent Hathaway, and his wife Sue of Darien, Carl Nichols Hathaway and his wife Sarah of Darien, and Andrew Oglee Hathaway, and his wife Amy of Phoenixville, PA; and his nine grandchildren: Drew, Brendan, Matty, Henry, C.J., Kelly, Aidan, Bennett and Cole. He also is survived by his brother, Kent and his wife Judy of Winston-Salem, NC. In addition, he is survived by his step-children Henry Joseph Dostal III, Mary McGee, Marshall Dostal and their families. Per Carl’s wish, a family-only service will be held at Martha and Carl’s beloved United Church of Rowayton. In lieu of flowers, the family appreciates any contributions in Carl’s memory, be made to The Fairfield County Hospice House, One Den Road, Stamford, CT 06902. Pete Roux, surrounded by family, died on Sept. 14. Antoinette Evans Clark of St. George, Utah, passed away peacefully on Jan.
Justine Arata Robinson, 94, died peacefully with family and friends, on July 21. Born in Brooklyn, NY, on March 9, 1924, the daughter of Louis and Phyllis (Kerr) Arata, Justine spent her formative years in Old Greenwich.